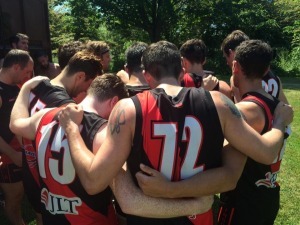 The Dingos have defeated their old rivals, the Toronto Eagles, by four goals to even the ledger with two wins and two losses for the season. Coach Justin Robertson urged the players to come out of the blocks strongly, and the team responded by booting four goals in the first quarter to open up a handy lead. "New Canadians" Mick McFarlane and Paul Tinkler were busy, presenting and creating scoring chances every time the ball entered the forward fifty, while Mike Karas drifted forward to kick an important goal just before the siren sounded to end the quarter. The Eagles mounted a comeback in the second and third quarters, but Mike Bocian, Rob McNaughton and rookie Greg Gilbert worked hard to rebound the ball and keep them to only four goals for the match. Tom Bell produced another strong game in the ruck, competing against one of the best players in the league in Neil Casey and having a major influence on the contest. Midfielders Pat Bossey, Geoff Hansen, James Duggan and Dan Gunn all ran hard in the heat and collected a lot of the footy around the ground. Next up, the Dingos face the Broadview Hawks at UTSC on June 25th at 1:30pm.